Members of Iraqi Popular Mobilization Forces demonstrate their skills during a military exercise at a graduation ceremony in Basra, Iraq, Jan. 31, 2019. The U.S.-led coalition fighting against the Islamic State (IS) in Syria and Iraq Monday denied it faced a head-to-head encounter with the Iran-backed militia known as the Popular Mobilization Forces (PMF) in the Nineveh province of Iraq. The Shiite militia in Iraq alleged its fighters Friday prevented the American troops within the anti-IS coalition from conducting a field operation inside the city of Mosul. "The patrol referenced was routine and there was no confrontation," Col. Sean Ryan, a spokesperson for the U.S.-led coalition, told VOA in an email. "The coalition is here at the invitation of the Iraqi government and this was coordinated with the Iraqi Security Forces," he said. The coalition spokesperson did not disclose more information about the operation. Abu Jaffar al-Shabaki, the head of PMF's 30th Brigade, in a press conference Saturday said the U.S. troops were surveying Mosul city and filming neighborhoods with video recorders. He alleged PMF fighters stopped the survey operation after U.S. troops reached the Presidential Palace area near the Mosul Hotel where a PMF headquarter is based. "These patrols reveal the presence of U.S. ground troops in Iraq, contrary to what is claimed as otherwise by some," said al-Shabaki, warning that "any future move of the U.S. forces will have serious repercussions, and cannot be accepted at all"
Ridwan al-Anzi, the deputy head of PMF's Nineveh Operations, claimed the U.S. troops ended their survey operation after the PMF warned them and blocked the road leading into the Presidential Palace area. "Our response created a state of observable panic and extreme fear among them, which led them to request air cover in anticipation of any action against them," al-Anzi said in the press conference Saturday. Members of Iraqi Popular Mobilization Forces demonstrate their skills during a military exercise at a graduation ceremony in Basra, Iraq Jan. 31, 2019. The PMF media accounts and Iran's state-backed news channel Press TV released a video allegedly showing the PMF militia stopping the U.S. patrol. The footage showed armored vehicles with PMF green flags blocking a road as armed men in military uniform, claimed to be U.S. troops, passed by. VOA could not independently confirm the authenticity of the video. This is not the first time the Iran-backed militants in Iraq claim to have challenged the U.S. troops in Iraq. The PMF last month claimed it prevented another U.S. survey in Anbar province. The U.S.-led coalition told VOA then that the operation, which was coordinated with the Iraqi security forces occurred without incident. The PMF is an umbrella organization of several Shiite militias formed in 2014 after the Iraqi army fled the area following IS attacks. The group includes U.S. terror-designated militias, such as Asa'ib Ahl al-Haq and the Badr organization, and Iran-friendly parties such as the Islamic Supreme Council of Iraq. U.S. officials consider the group a regional proxy of Iran that is increasingly threatening and provoking American troops in Iraq and Syria. An assessment of the U.S. anti-IS operations by the Pentagon's Office of the Inspector General (OIG) last November reported that Iran-backed militias were likely behind two attacks targeting U.S. facilities in Iraq last September, including mortar attacks that targeted Baghdad's Green Zone and landed near the U.S. embassy, and rocket attacks that targeted the Basra Airport, near the U.S. consulate. The PMF says the presence of U.S. troops in Iraq is a violation of Iraq's sovereignty and has constantly threatened action against them if they refuse to withdraw. Qais al-Khazali, a powerful PMF leader known for his anti-American sentiment, told Associated Press last week that he expects the Iraqi parliament to vote in favor of U.S. troops withdrawal in coming months. FILE - U.S. President Donald Trump speaks to reporters after signing a proclamation declaring his intention to withdraw from the JCPOA Iran nuclear agreement in the Diplomatic Room at the White House in Washington, May 8, 2018. 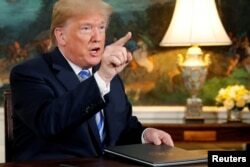 U.S. President Donald Trump has, however, stated his country's troops will remain in Iraq to counter Iran's threats. He said the troops would soon be moving to the huge Al Asad Airbase in Iraq's Anbar province and that their new tasks would include protecting Israel and keeping an eye on Iran, which his administration has accused of being the world's leading state sponsor of terrorism and of wanting to acquire nuclear weapons. In a CBS interview broadcast Sunday, Trump said U.S. troops withdrawing from neighboring Syria would soon be moved to the huge al-Asad Airbase in Iraq's Anbar province with a new mission of protecting Israel and countering Iran. "We spent a fortune on building this incredible base. We might as well keep it," he said. "And one of the reasons I want to keep it is because I want to be looking a little bit at Iran because Iran is a real problem." The comment by the U.S. president caused uproar among Iraqi officials, with the Iraqi President Barham Saleh Monday asking the U.S. "don't overburden us with your Iran issues."